The best Cheez-It Macaroni and Cheese recipe! 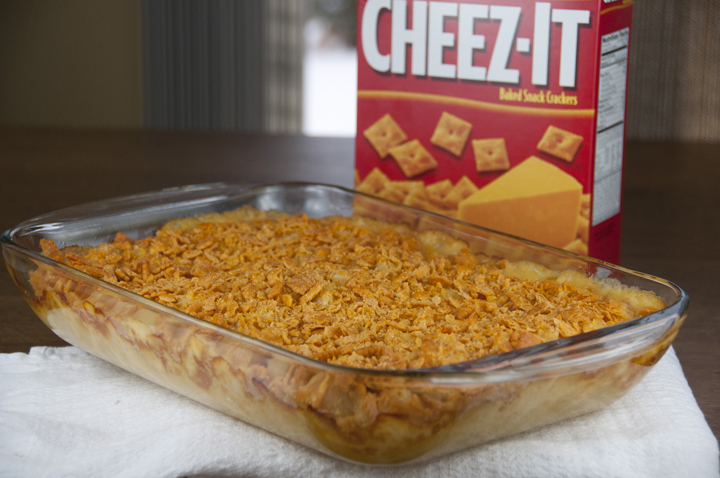 It's perfectly creamy, cheesy and unique because of the crunchy cheez-it topping baked right on top. Cook pasta to al dente according to package directions (you will be baking it later). Melt butter in saucepan over low heat; whisk in flour, and cook, whisking constantly, 1 minute or until mixture is smooth. Increase heat to medium; gradually whisk in 2 cups milk, and cook, whisking constantly, 5 minutes or until mixture is thickened and bubbly. Stir in cheese, stirring until cheese is melted. Stir pasta and ground black pepper into cheese mixture; spoon into a lightly greased 13 x 9 inch baking dish or a 3-quart casserole dish. Spread crushed Cheez-It crackers evenly on top. Bake uncovered at 375°F for 30 minutes or until thoroughly heated. Enjoy!